It's said that there are no stupid questions, but there are definitely questions that are not awesome. Thankfully, this question is pure awesome: what would happen if you stuck your hand in the world's most powerful particle accelerator? This question was posed by Sixty Symbols to several physicists, all of whom had different takes on this rather unusual subject. You can see their answers in the first four minutes of the video below. As Phil Plait at the awesome Bad Astronomy blog observes, you can actually see the physicists working through the question in their heads, each focusing on a different part of the problem that interests them and using that to come up with an answer. 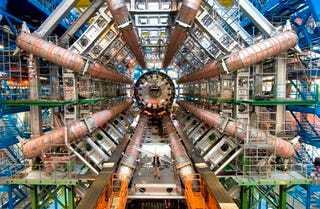 So what would happen if you stuck your hand in the LHC? The short answer is...we don't know. But maybe just before when the Collider is due to go offline around 2019, the scientists there can run a somewhat safer, hands-free version of that experiment to find out the answer.